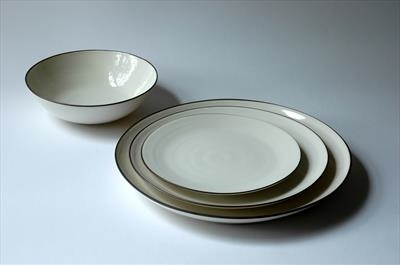 dessert bowl £38 (18cm diam; larger, pasta bowl also available - 22cm, £46), small plate £25 (18cm diam), medium plate £36 (22cm diam), large plate £52 (27cm diam). Usually made to order, please check for delivery times. Finely thrown porcelain tableware with a pared-down aesthetic.